Check out our Android Version! YOU CAN FIND THE CHORDS ON PIANO, GUITAR, UKULELE, AND MORE! Switching musical instruments is very easy. You simply tap on the image of a new instrument and try it out! Select the desired key and chord type, and the app shows you how this chord looks like as sheet music (for piano) or chord charts (for string instruments). Listen to the chords by tapping on the Play button. In settings, you can select your preferred Tuning Option. It is possible to choose the chords for right-handed or left-handed players. For string instruments, you can set the specific position of your chord on the fretboard, and the App shows you how many chords are available at the selected Position and all chord Charts. 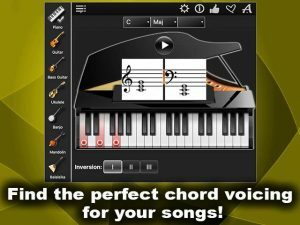 The app window contains the inversion buttons for piano on the bottom to invert your chords. Download the app and explore thousands of chords on 7 music instruments! Hello, and welcome to app! This application will help you find the right chords for your u music. There are seven instruments, under which it is possible to choose the piano, guitar, bass, ukulele, banjo, mandolin, and balalaika. String instruments look like. The application shows you how many chords of this type can be found on your musical instrument or keyboard. Now, select a musical instrument. Press the picture of the instrument you want to play. right Hand, and if you are left-handed, with the left Hand. Now we leave the Bass guitar settings. Let’s go back to the guitar. Select the key and type of chord, and a supplementary, if you like, or we can, without Supplement a try. 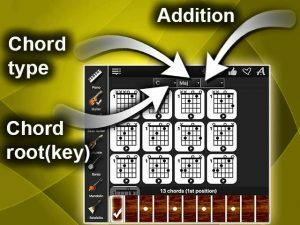 The app shows you how many such chords are available in this position on the fretboard. You can change the position of the handle, see, in this position there are 23. Let’s play one. All musical instruments in the application are interconnected with each other and it gives the ability to play the same chord on piano, bass, ukulele, banjo, mandolin and balalaika. For the piano, you can apply the chord-inversions. To do this, go to the Inversion, which is located on the bottom of the App window. Now let’s invert the chord and invert it again.